Still hard at work on Project Natalie. But I had to take a break and share a little holiday cheer with you. As you may remember, we have a tradition in our little home: I purchase a new Hawaiian holiday music CD at the start of every Christmas season. Not necessarily a new CD, but one that’s new to my ever-expanding collection of awesome Hawaiian music. This year, I didn’t labor over the decision of which CD to buy. 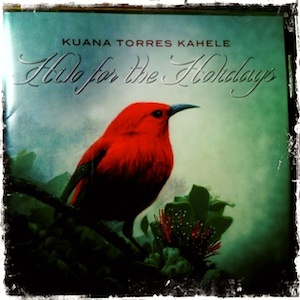 One of my favorite Hawaiian musicians, Kuana Torres Kahele (part of the group Nā Palapalai) had released his first Christmas album, HILO FOR THE HOLIDAYS. Here’s a photo I took of the album’s cover. Note: My camera doesn’t really do it justice. Yup! I can recommend it without any hesitation. I’m… well… I’m kind of addicted to it. In fact, it’s playing right now while I type this post. It’s too hard to say which track is my favorite. Why? Well, it changes. Each listening brings something I hadn’t heard before… And a new favorite emerges. Today, the favorite is his recording of the Christmas classic, Silver Bells. Growing up along the East Coast of the continental United States, we had really “traditional” Christmases (at least, “traditional” in the Hollywood movie/Norman Rockwell sense)–most of ‘em complete with snow on the ground! And this song makes a lot of sense if this imagery is familiar to you. Knowing what the holiday season looks like/smells like/feels like living in NYC, it’s really familiar. (I recently read the story about how this song came to be written by it’s composers Jay Livingston and Ray Evans. Wanna read it, too? Check out the book SONGWRITERS ON SONGWRITING. Fascinating!) It’s been a favorite song of mine for as long as I can remember. Hearing Kuana sing it–even though there’s nothing “tropical” or Hawaiian, per se, about his delivery–the song still imparts a Hawaiian vibe. I can’t explain it. It no longer feels like a New York Christmas carol. It’s more universal. Another favorite: ʻEKOLU MEA NUI/HALELŪ. The first song in this medley is near and dear to my heart. It’s one of Pops’ favorites. We sing it all the time in Hālawa Valley. He says the message is really important to living a balanced life. And the addition of HALELŪ (penned by Kahele, himself, I think!) is awesome. A perfect compliment to a Hawaiian favorite. And another favorite: HALELUIA. It’s the Leonard Cohen classic melody (Hallelujah) that you know and love–with new lyrics composed by Kuana. I know… I know… I get goosebumps, too. Wow!!! By the way, I heard thru the grapevine that the song HERE COMES SANTA IN A RED CANOE will be heard in an upcoming episode of Hawaii Five-0! *Super Bonus: The CD comes with fantastic liner notes–including the songs’ lyrics. I don’t know about you, but I love good liner notes. And I really appreciate having the lyrics–especially when it’s a recording that I’m not familiar with. So helpful! What are YOU listening to this holiday season? Is there a musical tradition that YOU have with your family? Drop me a line! I’d love to hear from you!